Get ready to amaze your friends and family! Be ready to hear, "How did you do that?" Nothing beats the feeling you get when you complete your first game and other people play it. Nothing is more inspiring than having people anticipate your next creation. Make your computer into a games factory today! 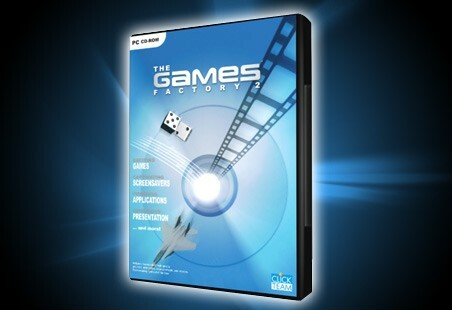 The Games factory 2 is the follow up to the hugely successful Games Factory. The Games Factory's simpler interface and controls can be a great way for adults and children to get started in the fun, educational, and rewarding, world of Click creation! The Games Factory provides everything you need to manufacture Arcade games, Platform games, Adventures, Screen Savers, and much, much, more. You simply click on an object, drag it to the play field, and click on the action it should perform. We supply all the heroes, monsters, powerups, and other objects you need, plus the sound and music for your games. Of course, you can easily add your own, custom items if you choose. Not only that, The Games Factory is so powerful, it gives you fast screen scrolling, fade effects, and can display FLI animations, Video for Windows, and QuickTime movies. You can also play your favorite music tracks directly from your CD. Choose The Games Factory now as an affordable entry into easy and enjoyable software creation, or as the perfect present for someone you know who would be thrilled by the ability to create games without programming. Either way, you have never experienced so much ease of use and power in one software package before! Discover how enjoyable and exciting it is to inject your imagination into your computer, without programming, and see the results instantly! There is nothing else like it. (1) Workspace Toolbar : Create the levels to your game/application. You can double click on any frame to display it in the frame Window (4). (2) Properties Toolbar : View the properties of your application, frame, and objects quickly and easily. (3) Large Icons: Easy to understand large icons. 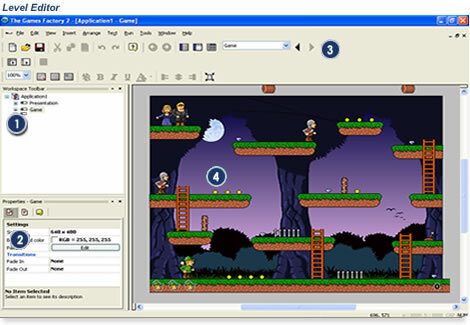 (4) Frame Editor : Visually place all of the elements to your program with ease. These elements could be images or programming related. TGF2's stylish new interface allows even the most novice of PC users to navigate and develop games without any prior programming knowledge. 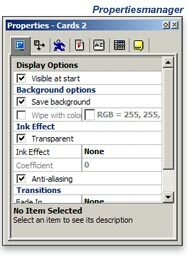 Best of all; the improved properties toolbar brings significant benefits to users of previous version. Anyone upgrading will be able to jump straight into the new version in no time. A major new feature that has been added in both TGF2 and MMF2 is the new debugger. The debugger allows the developer to systematically test and check their products before release. Everytime you "Test" your program, the debugger Window appears, you can pause, view program details, and even make changes. If you are a previous user of the software you will now save lots of time with this new feature, there is no need to add lots of counters to simulate tests, the debugger allows you to run them. You can turn the debugger on and off at any stage of the program, so you can turn the debugger on just when you want to test a specific frame within your game. 200 Mhz Pentium processor or higher, 32 Mb RAM (256 Mb for XP, Vista and 7).